Hi all!! Here today to share with you my monthly Project Life spread. I had fun this month, using some of the challenges over at the Noel Mignon summer camp on these spreads. This first layout, I used the "Basket Weaving" challenge. I have always liked the look of the paper weaving, but have never gave it a try myself, so this was a fun push to give it a try. Of course, right about now was when I ran out of adhesive, of course! So I used my tiny attatcher and decided to go for a more "messy" weave! I totally love how it turned out, the original plan was to use it as a mat for a photo, I ended up loving it so much, I just used it as a filler card. 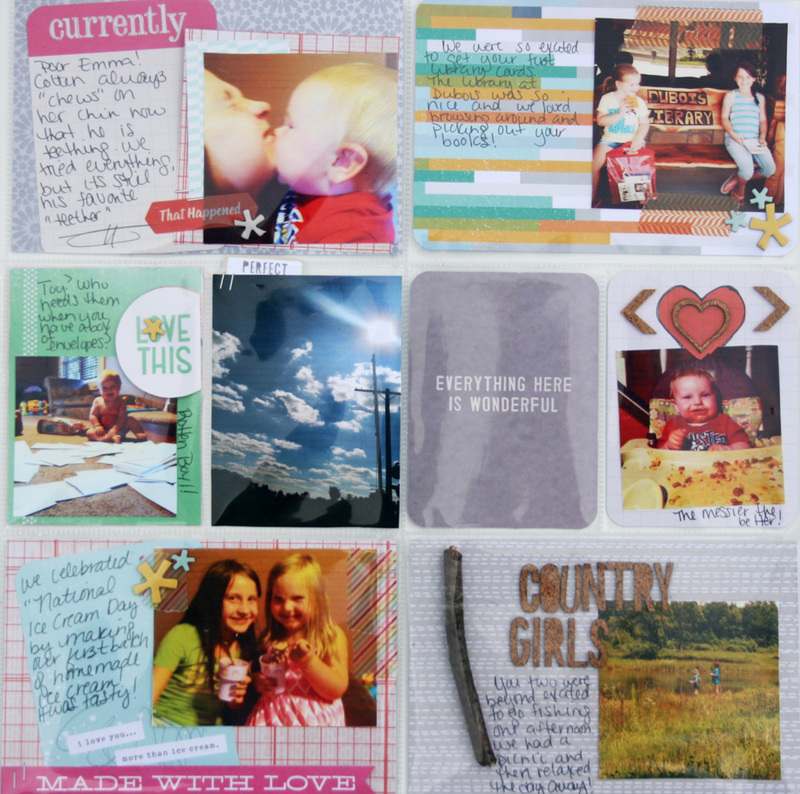 On the second page, I decided to use the "Nature Hike" challenge, which was to use an element of nature on your layout. I had this awesome picture of the girls fishing that I was planning on putting on here. So, I decided I'd get a little twig from out in the yard, tie it up with some fishing line, and have a cute little fishing pole embellishment...of course I didn't take into consideration that fact that fishing line is clear. So, it basically looks like I just glued a random twig onto the page, lol, but live and learn right. Its still a cute idea, and you can tell in person, so its staying! I am still having so much fun playing along over there, we are out this weekend, but I'm hoping I can finish up and get the remaining challenges in by the deadline on Monday!